The price of rice has spiked in Bangladesh after flash floods wiped out vast stretches of paddy field just ahead of harvest time. Unusually heavy pre-monsoon rainfall submerged 400,000 hectares of wetland in the northeast of the country, damaging some 2 million tonnes of rice. It is already having an impact on the market. Agricultural economist Quazi Shahabuddin, former head of the Bangladesh Institute of Development Studies, told Climate Home it will cause suffering across the country this year. A kilogram of coarse rice costs 38 Bangladeshi taka ($0.57), a 58% hike since the same period in 2016, according to official data. The government is planning to procure 600,000 tonnes of rice from countries including India and Thailand, the first time in six years it has relied on international markets. The food department has put out a tender for the first 100,000-tonne tranche. “The sudden flash flood has forced us to do that,” explained Badrul Hasan, director general of the food department. The affected districts Netrokona, Sunamganj, Brahmanbaria, Moulovibazar, Hobignaj, Kishoreganj and Sylhet are located at the foothills of Indian Meghalaya and Assam states. Known as “haor” or wetland, this region is typically inundated every year in mid-May and stays underwater for six months. The problem this year was not the volume of rain, but the timing. Flash floods came at the end of March, before the farmers had harvested the “boro” crop they rely on for their annual income. 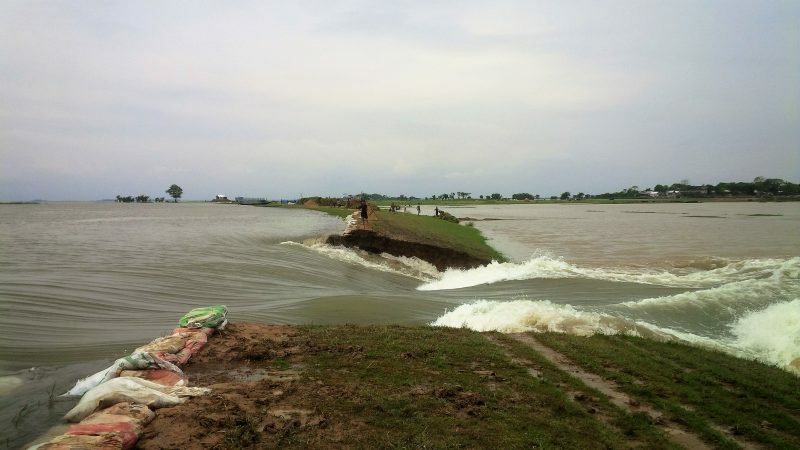 “My 6 acres of boro paddy has completely been submerged under water, which ultimately made my family destitute,” said Mala Rani Biswas, a farmer from Sunamganj district. “It is clear to me that the coming days will be harder because we have lost our crop and we have to wait for one more year to recover that,” she said. March, April and May is pre-monsoon season in Bangladesh and India, while the monsoon prevails from June to September. This year saw unusually high pre-monsoon rainfall both in Bangladesh’s haor basin and upriver across the border in India. On the Bangladesh side, March rainfall was more than three times the average – 905mm instead of 275mm, according to official data. This was followed by 1,748mm in April, compared to a typical 720mm. The Indian Meteorological Department recorded higher than normal rainfall across the northeast of the country from the beginning of March to mid-May. That swelled rivers, contributing to the havoc downstream. Saleemul Huq, director of International Center for Climate Change and Development (ICCCAD), said models of the impact of greenhouse gas emissions predicted greater variability in rainfall for Bangladesh. The Intergovernmental Panel on Climate Change (IPCC) identified Bangladesh in its last comprehensive assessment of the science as being at specific risk from climate change. The low-lying, densely populated country is highly exposed to sea level rise and extreme events like salinity intrusion, drought, erratic rainfall and tidal surge, which will hamper the its food as well as livelihood security. The Bangladesh Rice Research Institute has developed a variety of rice that takes 110 days to ripen, rather than the 135-160 days typical for a boro crop. That could help farmers adapt to the changing conditions, said the institute’s former director Jibon Krisna Biswas, but he noted “it is yet to reach the farmers adequately”. This story is first appeared in Climate Change News. Join our mailing list to receive new stories.